Choose from a large selection of bisque fired pottery pieces to glaze and make your own. Come for an hour or two - alone or with a friend and let your creative juices flow. For only $6 per hour plus the cost of bisque-ware. Children 12 and under must be accompanied by an adult. Leave your piece with us and we will have it fired in about a week. Cash or check only please. The Creative Arts Center in Thompson Park features pottery & ceramics studios, as well as classrooms for painting, drawing, and other craft activities. Many works of art created by students and instructors can be viewed in display cases that line the entrance of the building. 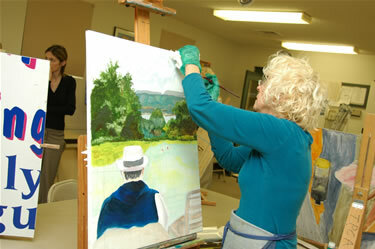 At just under 12,000 square feet, the Creative Arts Center serves as an artistic outlet for county residents. With about 2/3 of its space devoted to pottery and ceramics, the Center hosts several sessions of classes each year for all levels of students. Instructors provide guidance according to each student’s ability. Classes include Beginner’s Wheel Pottery, Open Pottery Workshop, Handbuilding, and Raku Pottery. 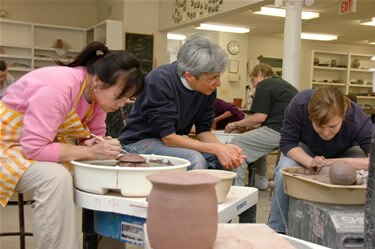 Classes are also held in ceramics, with students choosing from an inventory of pre-cast items. Visit our programs & registration page for upcoming offerings. Reflecting the diverse interests of county residents, the Center also offers a rich array of craft classes for adults & children as well as drawing, painting, knitting, crocheting, origami, jewelry-making, basket-making, holiday crafts, and more. the Center also offers programs for children. 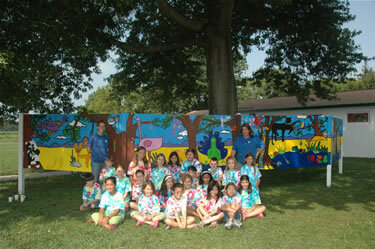 Youngsters can enjoy drawing, cartooning, painting, holiday-themed programs & summer camps. The Center also offers activities designed for home-schooled children, as well as birthday parties for youngsters. Garden State Parkway to exit 109. Southbound, turn right onto Rt. 520 west (Newman Springs Rd. ); Northbound, turn left onto Rt. 520 west 2.2 miles to Park (past M.T. Thompson park and Brookdale College entrance ) on left. State Hwy. 34 to Rt. 520 east. Southbound, turn left; northbound, turn right. Follow Rt. 520 east to Park entrance.